Where does Democrats for Education Reform’s single-issue extremism lead? Quick reader: why does this pithy description of the charter school lobby, quoted from a recent op-ed in the Los Angeles Times, sound, um, so accurate? If you answered *because this is exactly what’s playing out in Massachusetts,* you would be correct. 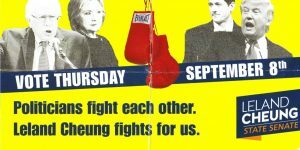 To see for ourselves, we need travel no further than Somerville, MA, which is the site of a somewhat, ahem, unusual political showdown. In one corner is Senator Pat Jehlen, a longtime progressive leader in the state Senate and public education champion. 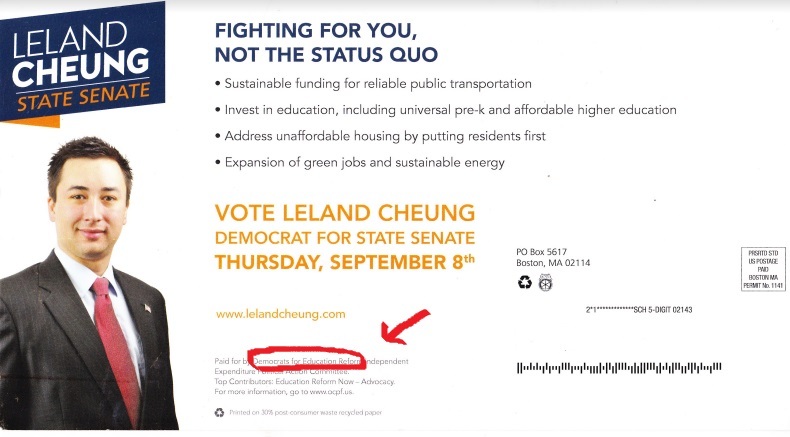 Her opponent, Leland Cheung, is a former Republican legislative candidate from Virginia turned Harvard student turned Cambridge City Councilor turned Democrat for Education Reform. Thirsty already, reader? Ah, Massachusetts, my adopted home state. How surprised I was upon alighting upon your shores so, so long ago, to learn that your progressive reputation is, how shall I put this delicately?, somewhat exaggerated. If you are reading this from someplace that it is not blue, perhaps you have even cast an envious eye in our direction, coveting our solid cerulean state. Alas, reader, beneath that solid blue Mass. has long lurked something less inspiring: a sort-of three party system in which conservative Dems play BFF with what there is of a Republican party, ganging up again and again to quash any kind of progressive agenda. 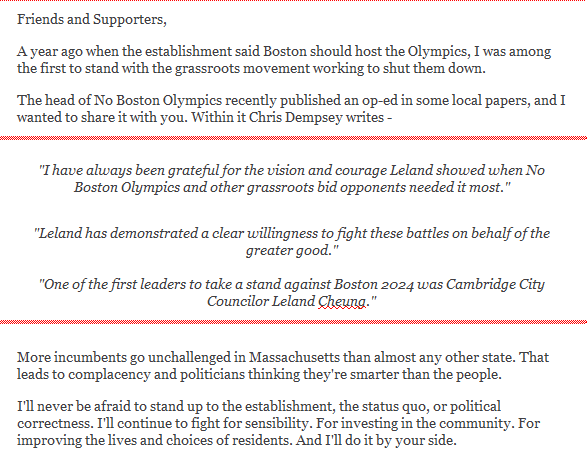 *But what of Senator Jehlen’s primary challenger, one Leland Cheung? * you are no doubt wondering impatiently. What do we know of him? Obvi he is no longer a Republican or he wouldn’t be Democrats For Education Reform’s guy. But is there anything else that we can discern from a candidacy distinguished by a distinct blank slatey-ness and, um, change-a-bility? 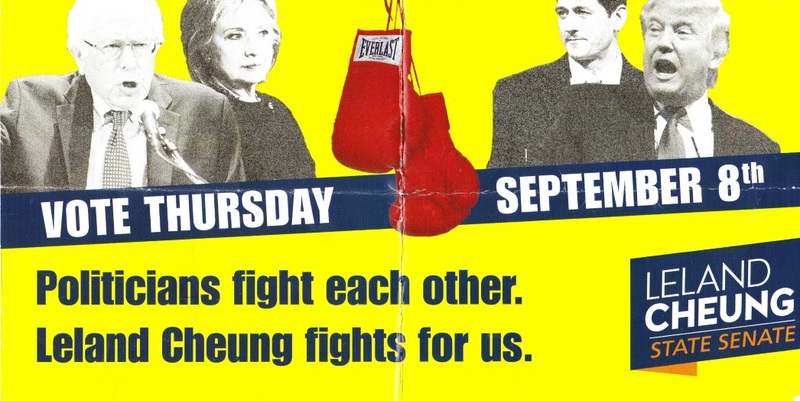 There’s this: while politicians fight each other, Cheung will fight for us, and not for the status quo. He’ll also fight *against political correctness,* according to a campaign email that he sent last week, which is ringing a familiar bell. 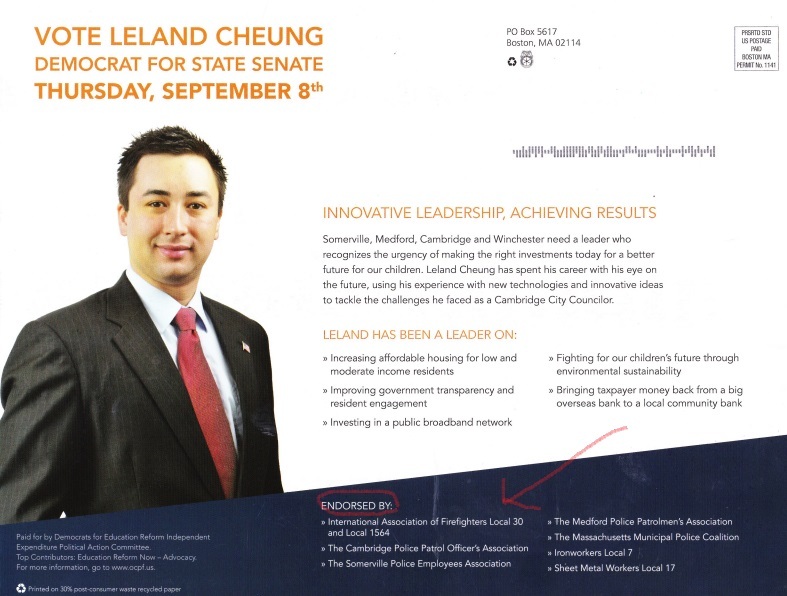 Speaking of door-related sounds, is that the mailperson I detect, delivering another DFER-sponsored Cheung mailing to the home of a Somerville resident? Indeed it is! Close observers will note that what appears to be a mailing from the candidate himself is actually not a mailing from the candidate himself. (Note my helpful encircling of well-heeled patrons). Also, that DFER’s signature issue —charter schools! charter schools! charter schools!—gets nary a mention in the mailer, which strikes one as, well, odd. But here is the mailperson again delivering yet another mailing. Surely this one will at last shed some light. 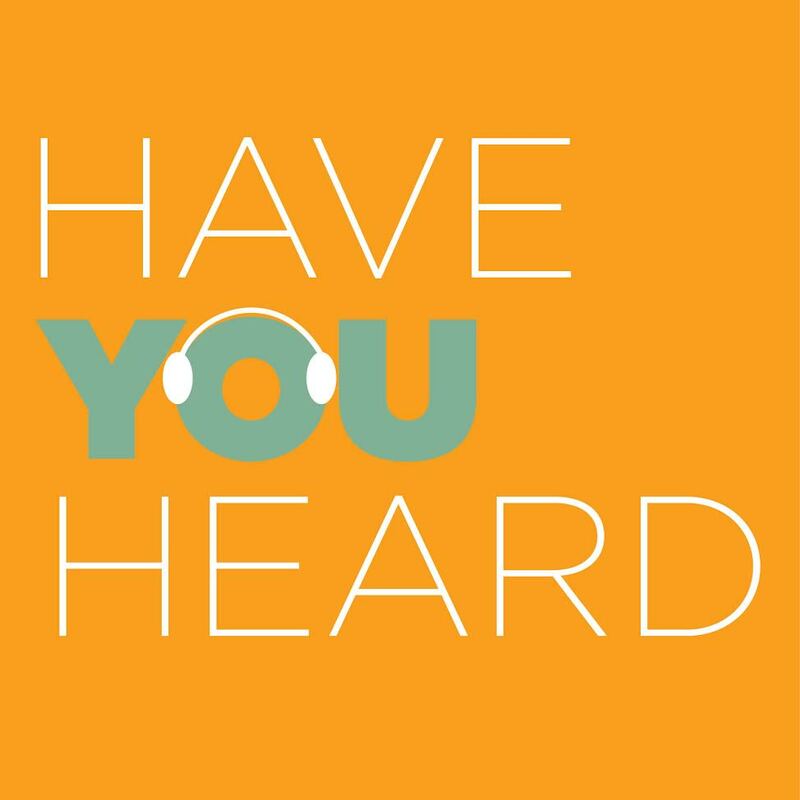 Jehlen is also involved in an effort to transform the way school quality is measured, so that it more accurately reflects what parents, students, teachers and communities value about their schools. The project got its start in Somerville thanks to Holy Cross education professor Jack Schneider, got the necessary state funding through the legislature thanks to Jehlen, and is now under way in nine school districts. Why does any of this matter? (And more importantly, why am I so excited about it?) Because if we move past the narrow fixation on math and English test scores, the whole debate changes and the *status quo* is upended. Which if I’m not mistaken, sounds a lot like education reform. DFER aren’t really democrats and they aren’t really for education reform. Here in Massachusetts, they are working to unseat a progressive Democrat who has been an active champion of public education. DFER is a brand and a lobbying group. Like other brands, they seek to build associations that may not exist—in their case, an association with progressive politics and educational improvement. Their work as a lobbying group, however, sends a very different message about who they are. They are dark money masquerading as democracy, promoting a single-issue agenda—charter schools—and relying on the support of donors whose names they’d rather not reveal to the public. Like my work? Help me do more of it. And written in Jennifer’s sharp and winning style! Keep up the great work! Are Twix & KitKats candies or cookies? Now THAT is a conundrum! Anyway, both your candidates sound like Demoncrats to me. Or would they be Dumbocrats (w/a silent b–no offense to that adorable Dumbo)? Finally, EdShy, there are many different shades of blue. In ILL-Annoy, we are Machine Blue (that’s a shade of blue-grey, as in turning grey when one is about to regurgitate). Your description of Massachusetts sounds a bit like the new California, since our open primary has skewed elections of Democrats to the middle. Pat Jehlen won! And it wasn’t even close: 77% to 23%.